Cross Mountain, Scodie Peak, Hoffman Summit, Walker Pass, McIver Spring, Kelso Creek and many other terrain defining features are named for early settlers who lived along the eastern slope of the southern Sierra Range in the 1860s. The name Butterbredt, often misspelled as “Butterbread”, is of special interest to those who recreate in the Jawbone/Dove Springs open areas and explore along designated routes of travel and trails in the area west of Highway 14 and south of Highway 178. Fredrick Butterbredt arrived from Germany sometime before 1860. We pick him up around that time prospecting in the Southern Sierra Ranges near Claraville in the Piute Mountains. By 1867, he, along with 500 or more other gold seekers, descended the high mountains and took up placer claims along Kelso Creek which they duly recorded in the minutes of the New El Dorado Mining District. It wasn’t long before merchants appeared on the scene bringing their wares and providing services of the type usually found in mining camps throughout the state at that time. They named the camp “Sageland”. A hotel, a boardinghouse, a general store, a number of saloons and an opera house sprang up near the intersection of the trail up Piute Mountain and the wagon road along Kelso Creek. Buildings were thrown together using materials at hand or parts of buildings brought down from Claraville. Typically, miners lived in tents and small units which they moved from camp to camp on flat bed wagons. 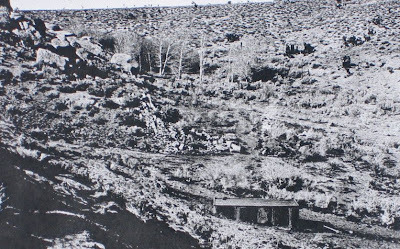 These units and tents scattered along the creek placed each miner near his find as protection against claim jumpers. Only a few hard rock mines proved successful and unfortunately what little placer gold found in the creek bed soon gave out. By 1879, most prospectors and merchants had moved on to the next discovery at White Pine Nevada leaving behind a few boarded-up buildings with for sale signs nailed to the door. Sageland, less than two years in the making, suddenly became a ghost town. The 1870 census lists: Frederick, his wife Mary, and two sons John and Thomas living in Kelso Valley. Mary, a full blooded Piute Indian, claimed membership in the Kern River Band. According to their story, Fredrick found Mary huddled with her small child in “thick tules” near the site of the Whiskey Flats Indian Massacre of 1863. A small detachment of U.S. Army soldiers was ordered to put down the Indian problems caused by a renegade tribe living in the Owens Valley. The local Kern River Band had no connection with those in the Owens Valley. According to personal accounts, they had always been on good terms with the settlers in the Kern River area. To show that they didn’t want to have trouble with the army, they turned their rifles over to the justice-of-the-peace so that the soldiers would know that they were not armed. This did not deter the captain in charge who was determined to inflict extreme punishment. His action resulted in the death of 35 men shot and stabbed while their loved ones looked on -- typical military justice on the western frontier. + [p- s are located in Section 10 near the center of Kelso Valley. The Butterbredt clan expanded and continued to live in Kelso and the surrounding region for many years. The US Geologic Survey started producing a series of maps in about 1910. The first issue of this area, “Mojave Quadrangle” at a scale of 2 miles to the inch, only shows a misspelled “Butterbread Peak.” The other Butterbredt features are shown on later maps beginning in the 1950s. They include the spring, canyon and well. This photograph of Butterbredt Springs was taken on January 1935 by U.S. Grazing Service. Water was piped to the cattle trough (center) from the natural spring located in the clump of willow trees shown near the top. The spring is now fenced and managed as a wildlife sanctuary by The Audubon Society.